This Symmetrical Autism Puzzle Piece Pendant Necklace features our symmetrical silver plated pendant on a generous 18 inch chain. It comes with a 18 inch 2mm Rubber Necklace (unlike natural rubber, neoprene will not burn or tarnish silver). With .925 Sterling Silver ends and lobster clasps. For extra style, you can add just $3 to your order and get an .925 Sterling Silver 1mm snake chain is 18 inches long and is brilliant and shiny. Has a sterling silver safety lobster claw clasp. Either choice makes a lovely necklace. Both chains are made in the USA. Great for Autism Awareness events and fundraisers. 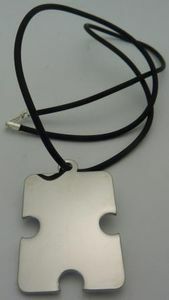 Silver plated puzzle piece pendant in the symmetrical design. Pendant measures 1.25 x 1.5 inches and weighs 3.5oz. Choose from neoprene or sterling silver chain (add $3). Features sterling silver safety lobster clasps. Please Choose your chain style from the drop down box prior to clicking 'add to cart'.